The first app (by release order) is called Second Friends and was developed by Art Fossett (I’m using the developer’s SL names in both cases). The app lets you display your avatar name and picture and a list of your Facebook friends that are using Second Friends on your Facebook profile. To use the app you need to do two things: you need to add the app on Facebook, and you need to pick up a personal key at an in-world kiosk on Eduserv island (you can reset the app and get a new key anytime). 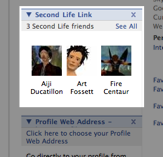 You can then enter the key and your avatar name in the Second Friends form in Facebook. If you got that right, the app will import your Second Life profile picture into Facebook, and you are ready to display your SL name and avatar picture (if you wish so) on your profile. To add and check for Facebook friends that are using Second Friends, you have to go to the My Friends tab under the app, and a list of friends (including their RL and SL names) will be added to your profile. If you wish, you can also choose to display their SL profile pictures instead. The functionality of this app is pretty simple right now, but future plans include adding an in-world tool for updating your Second Friends status while in Second Life and more. 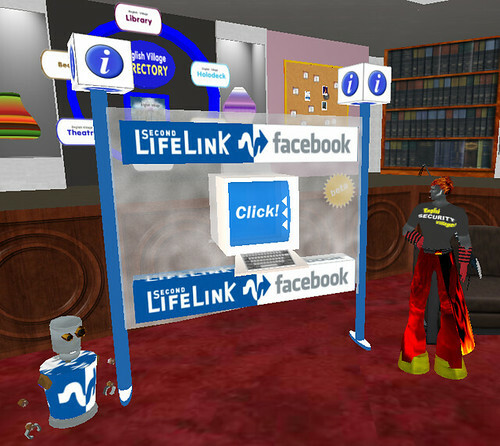 The second app, Second Life Link, was developed by Fire Centaur and another developer. It enables you to display your Facebook using SL friends in a similar way to the Facebook’s defalt friends’ list. The setting up process is similar to the one you have to go through with Second Friends, although it has a few extra functions. You can start the process by either adding the app on Facebook or by touching the in-world terminal in English Village. In both cases you will get a personal key that you must enter either on Facebook or in-world (again, you can get another key anytime). A neat thing about Second Life Link is also the fact, that your Facebook friends get the option to register for a Second Life account on Facebook (in case they don’t already have one) after adding the app. So you can also send invites for the app to Facebook friends that don’t have a second life and trick them into getting one ;) After you’ve confirmed your identity, the app will automatically fill in your friends list with Facebook friends that are already using the app. Then you can also modify your Second Life Link profile by adding your avatar photo and one home and one favorite SL location you want to share with friends. Your SL friends will then be displayed on your profile with avatar photos and names, and if you click the See All link in the app on your profile or access the app from the left-hand menu, you can view whether your friends are online or offline in SL, and you can also teleport to their home or favorite location from Facebook. Second Life Link also has advanced privacy settings, as you can see from the screenshot below, so you have full control of what your friends can see/do.